Trees are strong, robust organisms that can outlive many generations and survive some of the toughest ecological conditions. Yet there are many environmental factors that can contribute to a tree’s ill health or damage. These can include everyday weather conditions such as rain, lightning, wind and either extreme heat or cold. We too can unwittingly cause stress to our trees, especially to the roots. The roots can extend 2-3 times further than the canopy. Damaging them by digging for construction projects or compacting the soil around roots by parking cars over them can cause distress to the tree. A healthy tree will be displaying positive signs of good health. For instance leaves that extend from the main trunk, a full crown and substantial area of branches are good indicators. We recommend keeping an eye out for early symptoms of ill health. By having trees annually inspected (depending on the tree and conditions), particularly after a storm or periods of severe weather. This article will discuss some of the key signs to watch out for, helping you to spot an unhealthy or damaged tree. While cracks and splits in trees are pretty common and can happen for numerous reasons, some can be more sinister than others. Deep cracks and splits in the tree trunk can be a sign of a tree weakening. 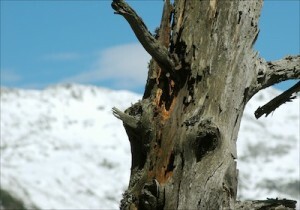 Frosts and cold temperatures are often the cause, particularly after a sunny day when the tree has had chance to warm. This is when the inner and outer wood of the tree expands and contracts at different rates. Large trees with multiple trunks displaying splits or cracks can result in a high failure rate. Inspect the trunk and large branches for deep cracks, as this can be a sign of structural weakness requiring a full evaluation. Cankers are holes where the bark has broken off. They can increase the risk of a stem breaking due to a weakness in the structure. Any damage to bark can provide an entry point for fungi and disease. Weak branch unions is a term used to describe when an area of branches is not securely attached to the tree. These weaknesses occur when the bark isn’t as strong as the wood, thus weakening the union of branches. Weak branch unions can be caused by two branches growing within close proximity, allowing bark to grow between each branch. It can be tricky to identify decay in a tree, as it often happens from the inside out. Having said that, there are several signs that can indicate a tree is decaying. 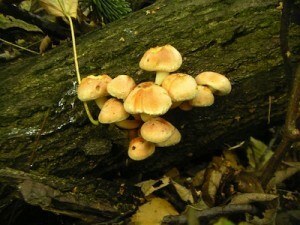 Mushrooms around the base of the tree or bracket fungi growing on the trunk or branches is a sign of hidden decay. The fungus may have been active in the wood for some years as these visible signs are the fruiting bodies. There could be an area of soft crumbly wood behind. It is also a good idea to examine the branches and trunks for peeling bark and hollow or rotten areas. Sizeable decay pockets – particularly where branches meet the trunk can indicate architecture problems. This is where a tree has an irregular growth pattern and can indicate a weakness or structural imbalance. Poor tree architecture can occur for many reasons, often after years of poor pruning, severe weather, climate and abnormal growing conditions. 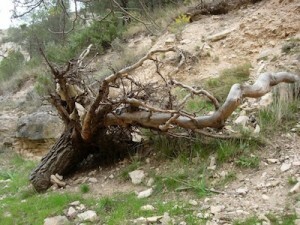 Dead wood, also know as widow makers are lifeless, dry pieces of wood that can be hazardous and snap very easily. In most cases dead wood is extremely brittle, limiting flexibility and making it almost impossible to bend in the wind, as opposed to healthy flexible branches on the tree. For this reason they are very likely to break and fall and can be extremely dangerous. Dead wood should be removed immediately, if dead branches are higher up the tree, heavy or out of reach, then an expert tree surgeon should be consulted. While there are many signs of poor (and good) health in a tree, the above covers some of the more common issues. If you have any concerns about your trees, or the problems raised above, then please contact us to discuss an expert evaluation of your tree, or you can view our tree services here. You can also leave a comment, send an email, or give us a call for further advice. This article was posted in Tree advice. Bookmark the permalink. Follow comments with the RSS feed for this post. Post a Comment or leave a trackback: Trackback URL.